One of the most critical points faced by engineers when developing the basis of a District Cooling and Heating plant (DCHP) is the footprint optimization. Footprint optimization, as it name indicates, consists in the best use of available space by reducing the constructed area, the exploitation of free spaces together with a logic distribution of the different rooms and compartments required. Optimizing the plant footprint is a necessary but challenging pursuit for any contractor. It’s necessary to ensure that the contractor is making the best use of its assets to meet demand and enhance profitability. Economically: It is easily understood that the less m2 of area required, the more savings of construction; less concrete, less manpower, shorter construction time and so on. Indirectly it will also affect some other works as electrical, HVAC, maintenance, housekeeping, etc. Municipality normative: DCHP normally are located in urban areas. Sometimes in these areas there are restrictions in terms of design; limited area for installing the DCHP, limited height by the surrounding buildings or architectural restrictions to not break with the neighbourhood design with an industrial plant (DCHP). Contract terms: It’s also very common to have “limited space” defined in the contract since the bidding stage. If so, the best engineering practice are required to comply the contract with no deviation. Calculate the dimension of main equipment: mechanical, electrical, I&C, etc. Calculate and establish the area required for the normal operation of the main equipment: mechanical, electrical and control rooms, offices, workshops, storages, etc. Based in best engineering practices, these areas shall be enough to operate the plant without interferences within the different equipment. Design the DCHP in such a way the distance for interconnections within equipment and dedicated rooms are minimal. Calculation and designing of DCHP maintenance areas. Calculate and design emergency exits and escape routes without obstacles in between. Design of mezzanines for cable pulling, pipe routing and HVAC ducts. Study the groundwater table to consider basements or floors above ground in the design. Define the services and facilities to be included in the DCHP: Offices, meeting rooms, lobbies, bathrooms and others. Well designed and located stairwells taking advantage of dead spaces. Let’s stop at this point that may be the key to award the project and one of the challenges to overcome. ARANER as DCHP specialist uses at this stage much of his resources from the R&D department. The correct selection of the technology besides being an important point to achieve the highest overall plant efficiency, it is important at the time of footprint optimization. Depending which is the technology selected, the number of pumps, compressors, motors, cooling towers, air condensers and secondary equipment may be affected and therefore the area used to locate, feed, control and operate these may be increased or reduced directly affecting the DCHP design and its footprint. 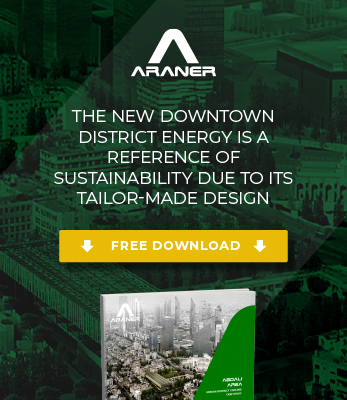 For that, ARANER is always collaborating with contractors, consultants or final clients to study, design and develop their DCHP under any specifications and contract terms. In the following figure you will easily identify how a good selection in the technology, like the direct condensation, may reduce the required space for the mechanical equipment. When selecting direct condensation technology the required space is reduced considerably. Inside the area typically designed for a traditional chiller, two direct condensations chillers can be installed. Besides, you will save the condenser pumps for pumping the water to the traditional cooling towers. These condenser pumps in addition to occupying much area in your DCHP also affect in a negative way to the total plant efficiency because of their normal high consumption. And finally, more savings are coming from reducing the pipe sizes. The water pipes are wider than those carrying refrigerant to the evaporative condenser. For all that reasons, plus savings electrical jobs and others, the selection of technology is a very important aspect to consider. 30 % in footprint reduction. 35 % reduction in required site manpower. The machinery may be reduced. A logic interconnection within items may result in reduced costs. Project deadline: It may be improved in same proportion as civil works are reduced. The points above in combination can lead to the award of the project and the success of all engineering team efforts! The following case was a real Project where ARANER was requested to prepare their alternative for a DCHP with 90,000 TR of Cooling Capacity. ARANER with its experience was able to design the DCHP reducing in two floors the whole plant. It was achieved due to the correct equipment selection and technology to be used. It supposed of course a benefit in terms of construction, the project became more profitable, minor civil works, minor risks…and an improvement in the plant efficiency going from 0.78 kW/TR to 0.72 kW/TR. Do you want to learn more about our footprint optimization solutions? Do you need improvements in power plant? Visit our website or contact us. Our experts will be available to assist you!